In the blogs and magazines I frequently read a reoccuring topic is the hostess gift and how to shake it up. A traditional bottle of wine is lovely, of course, but every now then it’s nice to give a host or hostess something a little different. A few partners in Sean’s practice area are hosting the rest of the group at their beach houses this upcoming weekend and soon after we received the invite I started to think about how to shake up our hostess gifts. 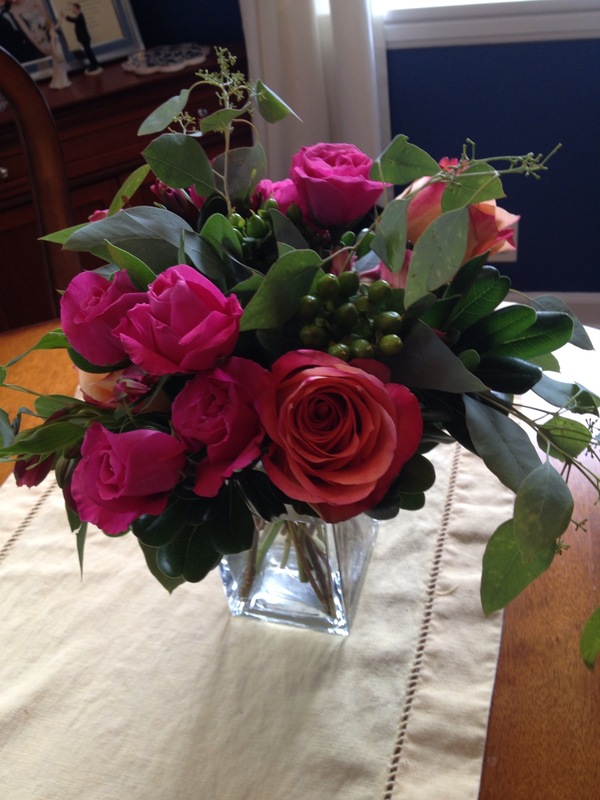 Initially I thought I would arrange flowers. 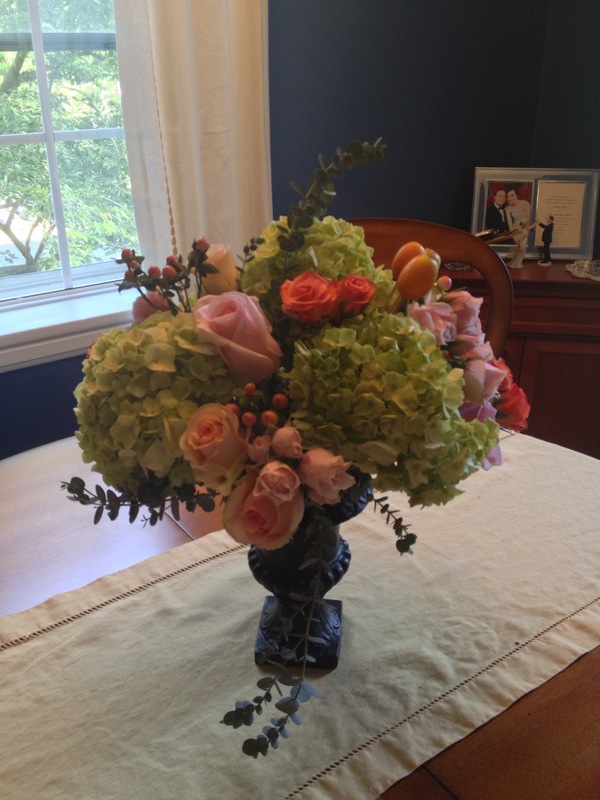 I’ve taken two floral arranging classes this summer and was happy with the result both times. In both classes, my instructor emphasized the importanace of having a flower recipe to map out the number of flowers and greens needed along with an idea of where the stems should be placed within the vase. For my hostess gifts I wanted to use a pitcher as a vase. But how would I replicate the recipe for a short vase (left picture) or the recipe where flowers are poked into foam (right) into a pitcher? Expressing our gratitude became stressful as I questioned how to make it work, how to keep the flowers vibrant on the 2+ hour car ride, and whether we were giving enough of a gift to show our thanks. Providing shelter, food, and a good time to a whole department of people and their families is quite a bit of effort. Are flowers in a pitcher an adequate toke of appreciation? Looking for something shaken yet appropriate for such effort, I scanned the internet. A dangerous game. This woman baked cherry pound cake to include with a gift of cut flowers. Lovely. 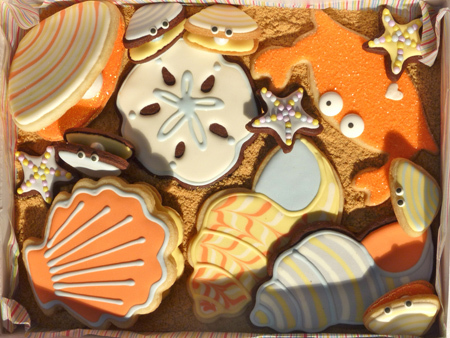 A pinterest search brought me to cookies which brough me to an internet search of beach themed baked goods which brought me to these adorable cookies! After much debate (in my head) and a few emails seeking the advice of my mother and friend, it was settled. 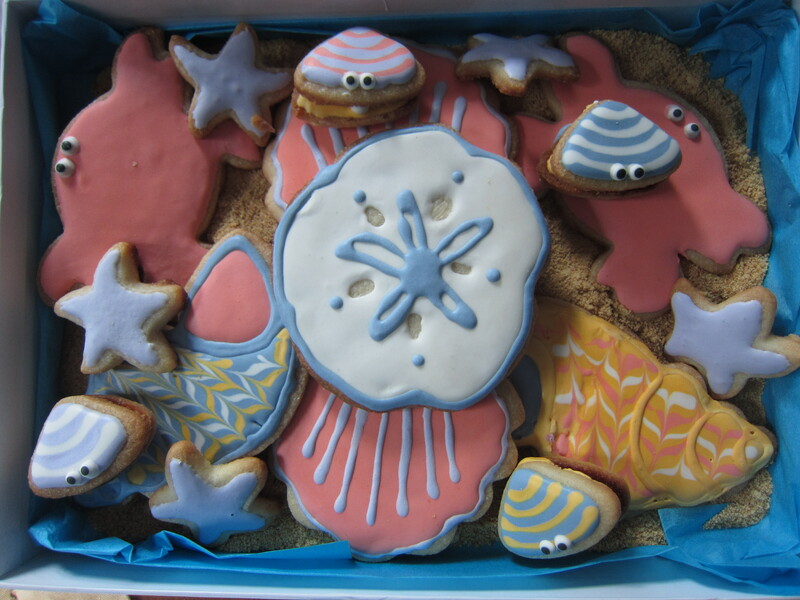 Beach themed sugar cookies, at least in my mind, seemed more appropriate. More effort on my part to thank them for their’s, and something personal with the beach theme. 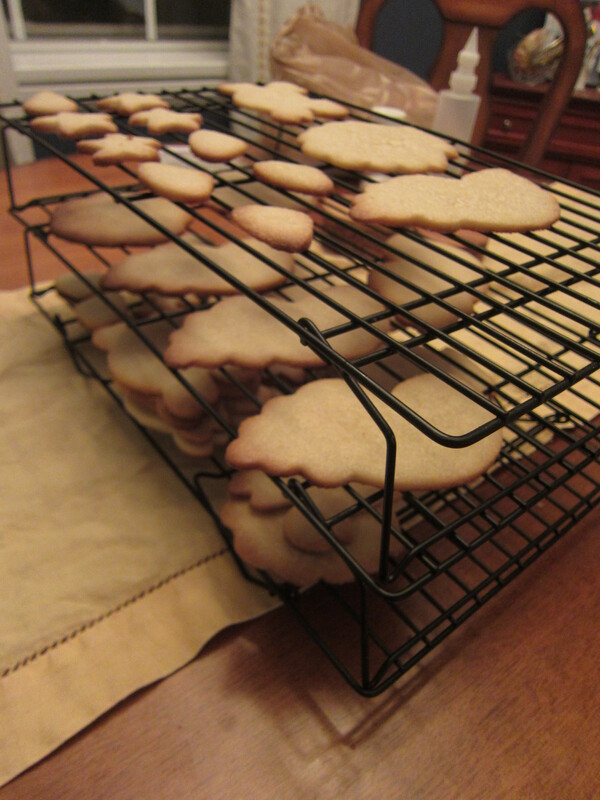 Plus, sugar cookies are a Christmas staple. They can’t be that hard because everybody’s doing it. They are hard. Maybe I made my dough incorrectly or maybe it was because our air conditioner was on the fritz making the dough soften so quickly, but just the first step of cutting out the cookies, getting clean edges, and getting them to the cookie sheet was so difficult. I had had a bad day on Monday. I needed a victory and foolishly thought baking these cookies would be it. I was wrong. I cried. Poor Sean. He really wasn’t expecting me react in this way. But he handled it so well. He Googled and suggested. 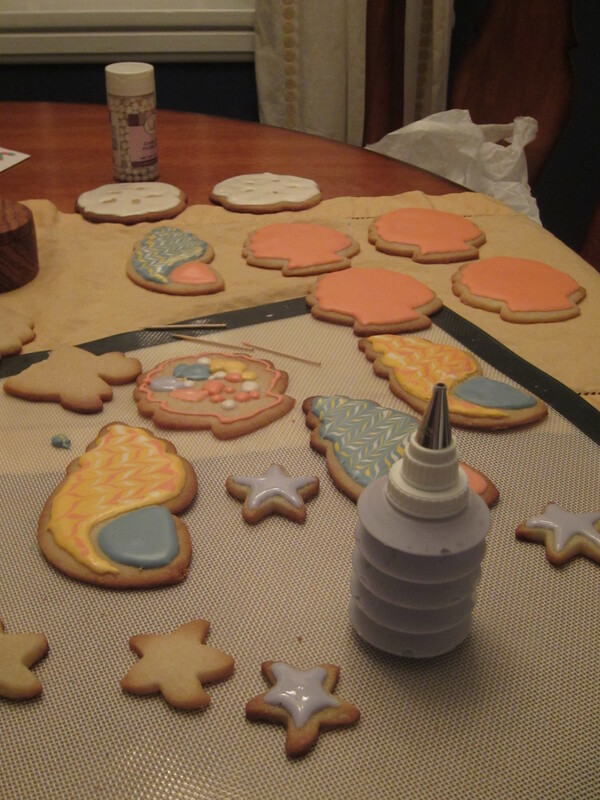 With his calm and help I got through it and made some adorable cookies of my own. This entry was posted in crafts & projects, professional life, social by Sarah. Bookmark the permalink. Those are adorable!! Way too pretty to eat! Enjoy your weekend. Thank you! Hope you have a nice weekend, too!